As a medalic sculptor, Heidi Wastweet produces coins, tokens and medals for clients worldwide. This exhibit shows the evolution of her personal work, in which she applies her exquisite bas relief to contemplative subjects. 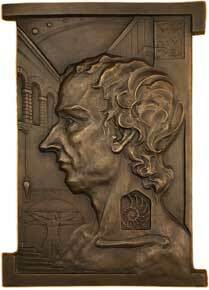 The Architect (2005, 7x11 inches, bronze, edition of 20), is an homage to the process of creation, wherein anything built is forethought. The profile of a symbolic architect, deep in thought, is surrounded by emblems of design and structure, balance and proportion. The piece celebrates the architecture of nature with a nautilus shell and the course of the planets across the sky. By placing the collar bone of the man outside his body, as if laid on his shoulder for display, the artist renders the framework of the body as a metaphor of building. A virtuoso rendering of Da Vinci's Vetruvian Man and her own sketch for this work are etched as texture into the background.